Be prepared for a warm welcome to the world of John A Brennan, an unapologetically enthusiastic Irish raconteur who has found his place in the spoken word scene in and around New York City of late. 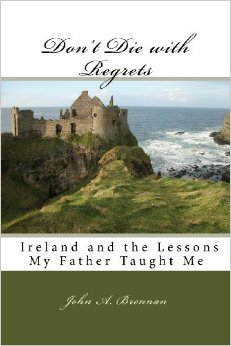 In his book Don't Die with Regrets, we join the author racing page by prose page through anecdote and apocrypha—poems too—as he invites us to join in his wild embrace of Irish mist-enshrouded historicity. Why would we do such a thing? To establish, as the author has, the connection between the personal experiences of our lives and the resonances of the ages. And because, if Brennan is right, there's a truth in that connection which defies the ordinary and makes of our lives more than the mere accretion of mundane isolated phenomenological experiences. Brennan's prose explores the interface between the mythic and the phenomenological with an aplomb that would give a highwayman courage, or make a fair maiden's blood go cool as summer rain as she turns over her silken purse and empties it out. The text is rich with charged moments. What lies behind those two glowing lights at a remote midnight border crossing, as the smuggler with his chickens in wire cages hides the more illicit goods hidden in a jute bag? What terribly instructive history is contained in grandfather's death grip on a young boy's hand, and his mother having to pry the fingers open to extract the that hand? What unspoken message passed down in a place called 'Urker,' named for an ancient practive by funerary mourners casting stones to form a cairn at a loved one's grave? I suspect most of us can recall an odd or exceptional moment in our lives when something preternatural occurs. Some odd experience that feels disconnected and beyond rationality—beyond the explication of aura or channeling or resonance or more traditional spiritual dogma. In a palpable sense, Brennan makes that connection. He convinces us that, properly viewed, the odd revelations of our own days are connected to myth and history in ineluctable ways. To the extent we are moved by his view, are we not fifth cousin to faeries who struck a bad bargain with some powerful invaders and got half the land -- but only the underneath half? Are we not descendants of refugees who sailed from the Caspian in a fleet of forty-four ships? Are we not sired by a race of escaped Greek slaves who found temporary freedom before being conquered by Gaels, and forced to wear breeches instead of a toga and cloak, as a sign of their servitude? Are we not descendants of Noah's little granddaughter, who missed the boat but found another ship to hop, and sail halfway around the world to a little spot in County Cork she could call home and be buried in? And is our life not connected to a young Scythian lad who spied the green hills of Ireland across 500 nautical miles from Galicia? To Celts? To Druids? To highwaymen or gypsies or superstitious fisherfolk? As Marlon Brando, aka Dr. Mickler in the movie Don Juan deMarco, declares, Why not? Perhaps we all of us possess our own ancestral equivalencies. Surely to read this little book is to feel the more strongly that we do. "Bob Marley once told me 'every conversation be a revelation,'"writes Brennan in Chapter 2. From cover to cover the man reminds us that, apocryphal or 'real,' we are surrounded by revelatory moments. It would be regrettable to miss the opportunity to hear this message. Pick up a copy of Don't Die with Regrets. This is the good stuff. It rings clear as crystal.